Think about how quickly some of your favourite apps (Facebook, Instagram or BBC news) load on your mobile phone. A world of information is available almost instantly with just one tap. Now think about that experience through your web browser when visiting your site. One tap to open the browser, another tap for the address bar, a few more to enter the URL (assuming you know it, if you don’t, be prepared to search), and then you need to wait while the website loads. It may not fill the screen or is too small, worst it has no real functionality. What makes this worse is that mobile internet connections are fickle and often slow. According to Google, 53% of mobile site visits are abandoned if it takes longer to load. It doesn’t make for a great experience and it’s especially not ideal if your business relies on mobile traffic to survive, hence why native apps fulfilled this need, however with the launch of Progressive Web Apps (PWA) it makes life easy for small businesses who can manage content in one simple solution. 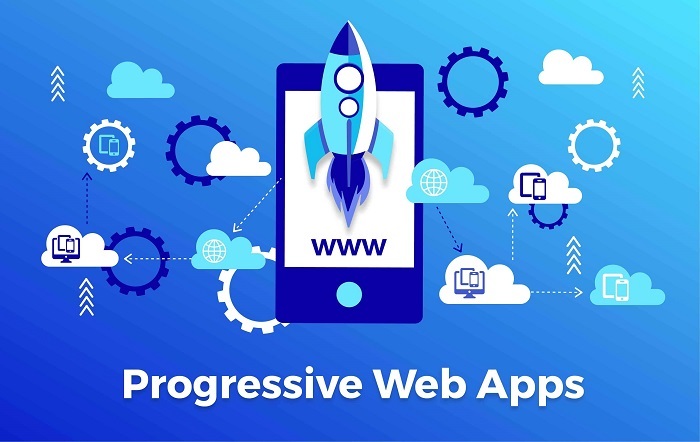 Progressive Web Apps solve this problem really effectively by combining the best of the web and native applications (apps), PWA’s require no installation, it’s fast, feature rich, and is both engaging and helps boost conversions. Some of the biggest brands in the world are already reaping the benefits: Forbes’ PWA increased impressions per visit by 10%. Alibaba increased mobile conversions by 76% and Twitter saw a 20% decrease in bounce rate. Now even Starbuck, Debenhams and Trivago are in on the act. Here are the top five features that make this such an enticing prospect for all types of businesses and organisations. PWA’s prompt users to add the website (web app) to their home screen, complete with icon and branding. This is the first step in creating a similar native app experience. Once the website (web app) is on the home screen (with no installation required), it will look and feel just like any other app. A prominent presence for minimal effort, ideal for those users reluctant to download mobile apps or has no space or other technical issues. PWA’s are a great addition in supporting your existing mobile apps to fill that gap left by Microsoft / Amazon or as an extension or replacement of an out-dated website. PWA’s bring many of the benefits of a native app experience without making sacrifices for devices that do not support them. Websites (web app) are now loaded with a full-screen experience on Android web browsers and safari is catching up soon. Users will now see more of your site on the screen, easier to navigate and operate like apps. This gives your website much more presence and a stronger brand identity. PWA’s can work with a limited connection, just like a native app! Your content is always going to be available, no matter how poor the user’s connection may get. Some of the best features that mimic a native app experience are push notifications that allow users to engage with web content in a way that normal websites can’t. Push notifications will appear in the user’s notification bar, in the same way, that notifications generally work. Publishers have full control over what they want to “push” to users and when they want to do it. At the moment it works for Android. Apple iOS will be releasing a version to allow PWA’s to send push notifications soon. There are many more benefits to be had from adding PWA functionality to your site, speed and performance improvements, enhanced functionality beyond those outlined here, plus more being added all the time. Google is actively working on this tech and more and more sites are adopting this concept to make their mobile experiences more dynamic, more user-friendly and better for their customers. PWA’s will automatically be updated, showing the latest version, without the need for manual updates or costly upgrades. Can I use this now? Yes. Google and Microsoft are leading the way and Chrome on Android devices (for the most part) have full integration; with Safari and iOS under development. All of this is great news for the future of mobile web development, and due to the progressive nature and ease of incorporating this functionality into existing websites and workflows, there is no reason whatsoever not to start using this technology right now as you will inherit new features and advances on our platform at no extra cost.